in that hole of a restaurant, I really ate well: pasta incaciata (pasta with cheese) and e sasiccia rostuta (roast sausage). All for a ridiculous price. You will ask yourself what has it to do with the task you have assigned me: go to Francavilla (... be careful not mistake with Villafranca...), look for Settevoci, the country house of your grandparents (...no, is not the programme of Pippo Baudo – stupid – is the place wich is called Settevoci...) and find someone to buy it. You know very well how much I like to pass as man sperto (expert) in Sicilian matters, and the first opportunity would have rush to. In fact yesterday, as soon as I landed at airport of Catania, I rented a car and after about forty minutes I was already with my legs under the table. You know, I said to myself: what shall I do, arrive out of Francavilla, stop someone along the road ad ask him where Settevoci is? Of course, as if we were at Busto Arsizio?! No, much better to stop to eat and then, discreetly, ask the people of the restaurant. I shall confess to you that when the owner's son looked at me in that way, and then also the mother and the cook, I really thought that you had made a fool of me: nobody knew of the existence of the mansion called Settevoci. Then, seeing my insistence, they accompanied me to a little old lady nearly, who remember it perfectly: and pointed out to me and I arrived easily thanks to the Romanesque little church. “Sgroj house!? The mansion sir?”A countryman met along the side of a lane, who I asked for information. In an instant I felt transported back a hundred years. It was not only the fascination of that mansion, asleep among citrus groves and cultivated fields that little by little were revealed to me but above all that poor man who, to accompany me up to the entrance, had begun to run along the path in front of my car so as not to force me to slow down: I had told him that I was a relative and he was treating me like a baron. Leaving that good man, who had told me of childhood memories "…mih… quanti libbri che cc’erano dda intra... (my word.. haw many books were in there...)", I started musing, while my view moved from the Greek rock of Castiglione to the peak of Etna, completely under snow. Dear Elena, let me say to you: thinking of getting rid of those rooms, and those frescoed salons is a real folly! It is really difficult to find a place like this! Is isolated from everything and everybody but on the gorges of the river Alkantara, twenty minutes from the ski-lift of Etna, a unique spot where you can ski watching the sea, and as many minutes from Taormina; the list could continue but I do not want to write a tourist leaflet for you. Let me make you a proposition: let's restore it, exactly as it was, without changing anything, with the frescoed ceilings, the salon, the dining rooms and the library. On the floor above, we can realize six rooms with bath for guest. What than? You will ask me. And than we can will found a club. No, good heavens no, nothing exclusive, a kind of golf club (in fact there is already one nearby, Il Picciolo). I mean a club meeting place for those who love Sicily and have capability of dreaming. Perhaps we could fix a modest enrolment fee with which you can stay the night with breakfast and transport from and to the airport. As I was returning to Catania I thought about a points card, for example, so that when one has used it up and wants to return, he can buy another. No look, let's be clear, I am not proposing opening a hotel, I am talking to you about a dream, a club where all you provide will be returned in services, and if during the year you cannot go there, you will get the equivalent in olive oil or in vegetable garden and orchard produce. Shall we do it? What do you think? 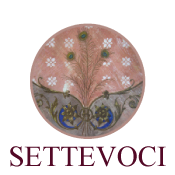 I have founded out that Settevoci is already a part of the town of Castiglione.